"Would you 'Adam and Eve' it! Wot a blinking mess", says 'dirty' Den Watts as he stands behind the Queen Vic's bar reading the headline in The News of the World [no longer available]. "Wot now? ", says Ang. "You still not moaning about Crossrail are ya? We all know it should have opened on 9 December but it ain't opening until 2020. We also know its going to cost £3bn more, the chief executive has resigned or was 'pushed' and everyone is arguing over what and when the Mayor of London knew about it. As always it's us, the hard working tax payer who has to pick up the bill." "Ang, will you give it a rest? I am talkin about the BBC's E20 project for rebuilding the EastEnders set including the Queen Vic", says Den sipping his Nespresso Fortissio Lungo pod coffee. "Wot? Who is messing about with our pub? ", replies a puzzled Ang wondering also where her Caramelito pod coffee is? Typical she thinks to herself, he makes himself a coffee but not her. What has the BBC been up to? Let's step back into the real world. With all the news of Crossrail one might have missed the latest National Audit Office (NAO)'s report, "E20: renewing the EastEnders set". Indeed, in light of the news over Crossrail (the Elizabeth Line) one would be forgiven for not picking up on the delay and overspend on this BBC project. The newspaper reports have highlighted the budget increase of some £27m from £59.7m to £86.7m with £44,000 having reportedly been spent on brick samples alone (that is a lot of bricks). Even allowing for a QS's contingency of 20% this still leaves a shortfall or overspend against the original budget of some £15m. That is the equivalent of nearly 100,000 TV licences at £150.50 each. By comparison the percentage increase in the Crossrail budget (£14.8bn to £17.6bn) is much lower. As to the completion date for Albert Square and the Queen Vic, the latest one is May 2023 (compared to 2020) by which time Crossrail should (one hopes) be up and running. What are the reasons for the BBC's delay and overspend? (1) The client's project delivery team was not sufficiently resourced and/or lacked relevant skills. This was not helped by the BBC's own plan for the project which did not spell out the specific skills required for the different roles within the team. It seems pretty obvious that a project can only be delivered successfully if the client's own delivery team is appropriately resourced in terms of skills and numbers. (2) The early estimates received from external cost consultants were "over-optimistic" and the BBC underestimated the time necessary to deliver the E20 project. Putting this another way, one could say that based on inaccurate forecasts the client's expectations were raised too high. I am sure there is a link between (1) and (2) in that unless the client's own in-house team is sufficiently resourced it will be difficult for them to 'test' the advice being received from external experts. In this context the NAO refers to the BBC's 2015 business case not detailing the need to 'age' the new set so everything looked the same. 'Ageing' a film set (and the old one will continue to 'age' too) takes time and the original idea of doing this concurrent with the construction of the new set was changed to being done by specialists under separate contracts. This change resulted in a funding increase. The cost estimate for the new set (the "Front Lot") seems to have been somewhat off the mark. The NAO reports an increase of £23.5m (75%) more than planned. The construction contract alone was £3.1m underestimated which seem odd when the NAO refers to this being explained by the "bespoke nature of the E20 programme", i.e. 'bespoke' usually translates into more cost. On the 'plus' side the NAO does say that the BBC has made improvements with "more realistic budget and cost schedule estimates". In other words, lessons are being learned but I am not convinced by this reassurance because has not this lesson been learnt on other 'bespoke' projects in years gone by. (3) No adequate change request and design change process. It would be very rare for any construction project to proceed from start to finish without any design changes being made. However, the BBC's 2015 business case did not include a change request and design change process which for a 'bespoke' and complex project seems surprising. In addition to there being no adequate process in place, the NAO report refers also to poor communication between the BBC's E20 project team and the EastEnders production team. In other words, it seems the people employed to make EastEnders and the people employed to manage and deliver the new set were not talking to each other effectively. The NAO says no formal design change process was agreed between these two teams of people until September 2016 by when a key design stage had already been completed. An omission to have a change request and design change process and to communicate effectively with what was the 'end user' (the production team) may go back to point (1), i.e. the client's project delivery team was not sufficiently resourced and/or lacked relevant skills. However, the NAO report does say that a more "robust" process was introduced in April 2017 and this was "further clarified" in April 2018. This too may be a 'lesson learned' but is one that should have been foreseen and planned for from the start. (4) "Known unknowns" or "Unknown knowns"
The E20 project included works on the "Boiler House" where asbestos was encountered. The NAO report says the presence of asbestos and also underground obstructions on the Front Lot were to some extent unforeseen due to "poor BBC site records and limited surveying work". This added £1.8m and delayed the project by some 4 months. NAO report says the BBC applied a contingency at the upper level of what the external cost consultant advised. However, the NAO also says that the contingency should have been higher given the poor site records, the limited surveying work and the existing knowledge of some underground obstructions. This point seems to link with (1) and (2) above resulting in the client's expectations in terms of cost and time delivery being raised too high. The BBC chose a single-stage open procurement for the Front Lot (the new set) notwithstanding the fact that four of its six framework contractors expressed a preference for an alternative approach. In addition, the procurement process was delayed from February to September 2016 and, ultimately, only one bidding contractor met the BBC's cost and quality requirements. A new two-stage procurement was approved in January 2017. This was started in March 2017, i.e. some 6 months after the first procurement process. The estimated cost of this was some £2.3m. Only the six framework contractors were invited to tender. This was despite the framework being for contracts up to £10m. Of these six only three submitted a tender and of these three only two met the BBC's requirements. The subsequent negotiations with the preferred contractor took 11 months rather than the estimated 5. The contract sum was £24.2m which was some £9.5m more than the BBC's revised 2018 budget. The NAO notes that the BBC is to use two-stage procurement for the Back Lot contract. I would suggest that a two-stage process would have been appropriate from the start given the 'bespoke' and complex nature of the E20 project. And while cost estimates can be lower than the tenders actually received an increase of £9.5m does suggest the original estimates were less than adequate. This links, once again, to points (1) and (2) above. Should we be surprised by Elizabeth? I don't consider we should be. If one looks back through the history of major infrastructure projects time and cost overruns are not unknown. Will it be open in 2020? I don't know. Only the project team can answer that question. The NAO is now investigating the Crossrail project. I look forward to reading that report. Should we be surprised by Queen Vic? In terms of the story lines, we usually are (I am amazed Sharon Mitchell (nee Watts) has survived so long) and while the rebuilding of a TV set may have its challenges I don't consider one can compare it to the complexities of Crossrail. Indeed, I would suggest that many of the points mentioned by the NAO as giving rise to the current time and cost overruns could (and perhaps should) have been foreseen much sooner. I have listed above five points that I take from the NAO's report, none of which I consider to be unique to the BBC's E20 project. Indeed, many (if not all) of them are 'human' failings and ones that I am sure many of us come across in our day to day work. The key to minimising the risk of time and cost overruns lies, I consider, at the start of a construction project. We all want to believe that a project can be done for £x and be completed by 'Y' date. Perhaps we all need a pinch of realism when it comes to forecasting time and money or as Denn and Ang might agree, "you need to focus on the 'brass tacks' as to what can be built, for how much and by when". 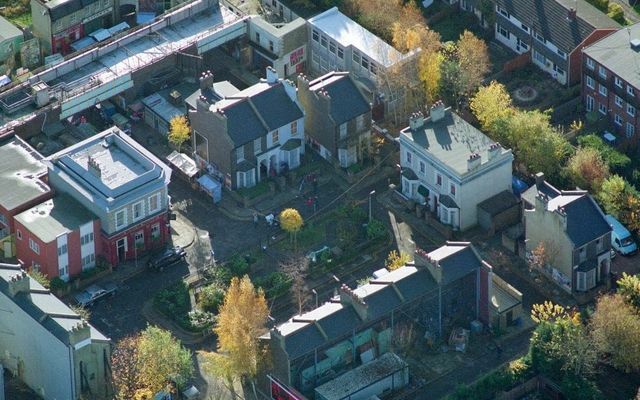 A BBC project to rebuild the EastEnders set is £27 million over budget and years behind schedule as designers must hand-paint every brick to make them look like the old ones. The National Audit Office criticised the BBC’s management of the ‘E20’ scheme, which is now expected to cost £86.7 million.